(NaturalNews) If you thought you were doing a pretty good job at controlling your sugar intake, you might not being doing as well as you think. Or, more precisely, you might not be limiting sugar enough, at least according to the World Health Organization (WHO). New guidelines issued recently by WHO say that added sugar intake should be less than 10 percent of your total daily calories, and consuming less than 5 percent of total calories from added sugars provides even more health benefits. The WHO guidelines come on the heels of a recent study that showed consuming too much added sugar increases your risk of death from heart disease. Other research has tied a high intake of added sugars, especially sugar-sweetened beverages, to many poor health conditions, including obesity, high blood pressure, type 2 diabetes and risk factors for heart disease and stroke. Based on a 2,000-calorie diet, Americans currently consume an average of 300 calories -- or about 15 percent -- from added sugars daily. So, as you can see, cutting 5-10 percent of that daily average is no small task. "America is a country drowning in sugar. In fact, the amount of sugar we eat and drink every year has soared nearly 30 percent since 1983 and is likely a major contributor to the soaring rates of overweight and obesity in this country," Franci Cohen, a certified nutritionist, exercise physiologist and creator of SPIDERBANDS(R), told Natural News. "Even worse, since sugary foods often replace more healthy foods, nutrition experts say the influx of sweets indirectly contributes to diseases like osteoporosis, heart disease, and cancer -- all of which are directly affected by what we eat," she said. Where do the added sugars come from? Popular sources include table sugar and brown sugar, of course, but one of the most common "hidden" sources is high-fructose corn syrup, which is a main ingredient in lots of foods. Also, sugared drinks like soda are huge sources of added sugar. Not included in the WHO study were sugars that occur naturally: sugars in fruit and fruit juices, among other foods. Some mainstream nutritionists might tell you that it is virtually impossible to reduce sugar intake to the recommended 5-10 percent range of daily calories, but experts who spoke to Natural News say otherwise. All it takes is a commitment, a little time invested in finding the right combinations of natural ingredients, some education -- and you're home-free. 1. Choose wisely. One of the ways Americans tend to not only boost their daily caloric intake but also their sugar is through improper snacking between meals. Wise choices made during these episodes will go a long way toward reducing your sugar levels. Try some nuts, says Briana Santoro, a certified nutritionist, author of Get Naked in the Kitchen and founder of The Naked Label, a site advocating clean eating. "I would recommend a mixture so they get a good variation of nutrients. My favorites are: Almonds, walnuts, cashews, Brazil nuts, and pumpkin seeds," she told Natural News. "It's important that they get unsalted nuts and make sure they don't contain added oils as these are often heavily processed." Here are some other healthy snack ideas: http://www.naturalnews.com. 2. Commit to making changes. Cutting your daily sugar intake really does require a lifestyle change, but it's worth it, says Ariane Hundt, founder of Brooklyn Bridge Boot Camp in New York City. "Get rid of cereal in your kitchen. It's the most processed food in the world and contains lots of artificial ingredients and sugar that is going to spike your blood sugar and then crash it, leaving you wanting more," she said. Instead, try some organic, pasture-raised eggs for breakfast, or one of these other suggestions: http://www.naturalnews.com. 3. Understand the risks of doing nothing. You have to decide that cutting your sugar intake is going to be worth it. "The inflammation in our bodies caused by excessive sugar consumption could be the number one factor in the influx of chronic disease that our country has seen in the past 20 to 50 years," Toni Sicola, a health and wellness expert who blogs at Passport to a Healthy Me. "Inflammation is a factor in obesity, diabetes, cardiovascular disease, cancer, Parkinson's, Alzheimer's, and possibly auto-immune diseases. It's a serious concern." 4. Don't set yourself up for failure. Hassan Khan, fitness guru and founder of Body Fat Demolition, said, "Never go to the grocery store hungry. When you go to the store hungry, it's nearly impossible to resist processed food loaded with sugar in the middle aisles right at eye level." Translation: You can't shop smart if you're starving. 5. Educate yourself. You need to become a label reader, says Kristina Sampson, author, holistic health coach and founder of the website The Vail Diet. 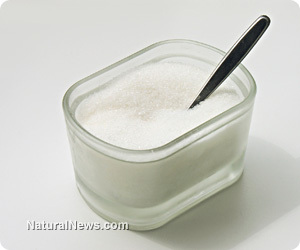 "Look for two things -- the amount of grams of sugar and sugars hidden in the ingredient list," she told Natural News. J. Anderson, a certified personal trainer, owner of Always Active Athletics and a Natural News contributor, agrees. "Many times when people try to purchase healthy products like smoothies or fruit salad at the store, those products are loaded with sugar to increase their shelf life and their taste," he told me. "You may think you are eating healthy when in reality you are consuming a lot of sugar. A simple solution is to buy the fruit and make the smoothie or fruit salad yourself!"